Are you ready for a reptile? February 10 marked the beginning of the Chinese Year of the Snake, and snakes have recently been in the news in Florida, where they had a Python round-up. Bennett awaits adoption at Colorado Reptile Humane Society. I have to admit I have had an aversion to snakes. Spiders, even tarantulas, never bothered me (well, I don’t care for black widows or brown recluse spiders), but snakes were always another matter! Soon after moving to my dream property, which had “live” water, I blithely went down to plant wildflowers by the creek. There, I encountered six or seven northern water snakes, sunning themselves in the very spot where I planned to dig. I am fascinated by natural history and love identifying birds, wildflowers, butterflies and, yes, even snakes. Besides, I actually felt the snakes had more right to that spot than I did because they had first dibs. Who knew how long they’d lived there? But I did want flowers, so from that day forward, I gardened in clunky galoshes and made a lot of preliminary noise, thrashing about with a stick to discourage any lollygagging lurkers. When I turned 50, I decided to face my fear head on. I contacted a herpetologist I know, and while he held the snake, I made one small step for my kind. I touched it. Hmmm. It didn’t feel all slimy as I had imagined. But that was enough hands-on for my first experience. Today I am reasonably free of my fear of snakes (although I still avoid parts of the garden where I’ve encountered copperheads during warm weather, but I don’t consider that unreasonable). I owe overcoming my unreasonable fear to a box turtle named Buster. Buster came into rescue after having been raised in captivity and losing his self-protective mechanisms, like pulling in his head to defeat predators. My daughter adopted him, and thus, he became an extended family member of mine. He was a very personable turtle and everyone in the family petted his head and held him, including me. His head and his skin looked very snake-like, as it turned out, but I was soon used to petting his head and feeding him by hand. One day, sometime after meeting Buster, I volunteered to staff an expo booth for our local Audubon Center. One of of the other volunteers was showing off a King snake. His head looked a lot like Buster’s, and without a thought, I reached out to touch him and soon held him. He sought out the warmth of my sleeves – and wound his way up one of them. it didn’t bother me a bit. Buster the turtle had provided me with a “successive approximation” toward snake holding that allowed me to overcome my snake aversion. Good old Buster. 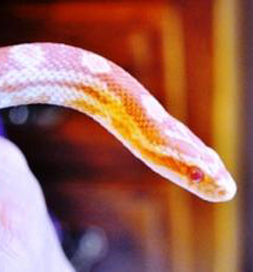 I’m sharing my snake experience as a segue to remind you that Petfinder is not all dogs, cats and furry creatures. A large number of reptiles are listed on the site. Many of the snakes have come into rescue because their original people didn’t do their research and the exotic pet turned out to be more than they could handle. I also want this to be a cautionary tale; before even considering adopting a reptile, you should learn more about the pros and cons. Don’t adopt one on a whim. The article cited in the first paragraph about the Python hunt in Florida, for instance, points out that people often are totally unprepared for life with Pythons and then inappropriately abandon them in the wild, where they become harmful to indigenous species and humans. According to the article, the release of Burmese Pythons in the Everglades prompted a state law against buying and selling them for use as pets and a federal law banning the import or interstate sale of Pythons. Before considering any exotic pet, you must find out from your state’s Department of Wildlife which ones are legal where you live. Your local animal control officer can tell you what is legal in your town or city. If, after doing your research, you’re still interested in having a reptile family member, check out the adoptable ones on Petfinder. They need forever homes, too.